Planning your next adventure is sometimes almost as much fun at the adventure itself, and a little preparation goes a long way. The following are some tips to aid you in planning a safe and enjoyable trip. Always wear your Personal Floatation Device (PFD). Ensure your boat safety kit is complete - it’s the law. Do not drink and boat - arrive alive! Don’t go alone, always use the buddy system, especially when swimming. Dress appropriately, carry a first aid/survival kit, water, map, compass and whistle. Exercise caution during cold water seasons - avoid hypothermia. Take cover during storms, get off the water during lightning and high winds. If lost or injured, control and secure the situation, mark your location, plan for shelter and stay put until help arrives. Backcountry trails have inherent risks – use at your own risk and skill level – trail ratings are guidelines only. Be aware of hunting seasons – wear blaze orange. Assess campsite conditions prior to set-up - assess potential hazard trees, drainage and fire pit location. Use trails for designated use only. Caution should be exercised near cliffs, slippery slopes, foot bridges and dam structures year round. For all emergencies call 9-1-1 – know the trail head 9-1-1 road number and name address – be advised that area cellular phone service is not 100%. Know the regulations and special areas of concern. Use established portages and designated campsites. Do not alter or expand campsites. Reduce, Reuse and Recycle. Avoid cans and bottles. 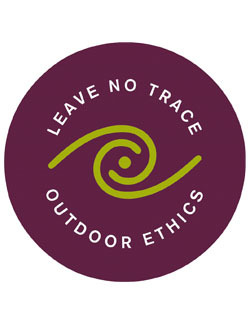 Pack it in, pack it out – leave no trace. Use campsite toilets, or bury at least 30m from water. To capture your memories, take a picture. Observe all fire restrictions. Use Camp Stove. Keep fires small, collect and burn dead and fallen wood. Drown your fire out with water before you leave. Store food rations and trash securely. Respect other visitors and the quality of their experience. Be courteous. Yield right of way. Let nature’s sounds prevail. Minimize loud noises. Avoid sensitive habitats like wetlands, bogs and streams. Have the right information, maps and equipment to make your trip safe. Know which areas and routes are open and suitable for your type of recreation. The ideal of the modern voyageur is to look back and see no evidence of his or her passing. If you achieve this ideal, you will be able to remember your trip with that extra satisfaction. Sunday through Thursday, 9:00 a.m. to 5:00 p.m.